In order to style the TitleBar of the RadRibbonView you have to create the style for the RadRibbonView itself and modify its template. To see how to do this take a look at this topic. 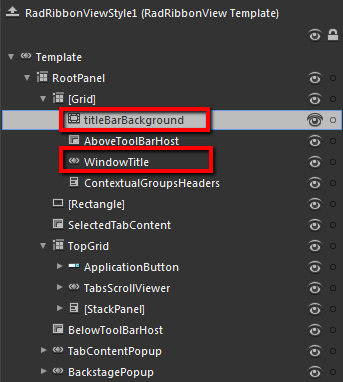 The controls responsible for the TitleBar are the titleBarBackground Border control and the WindowTitle control. The titleBarBackground Border control is responsible for the background and the border of the TitleBar. The WindowTitle control displays the title and the application name. To modify their appearance you have to modify the template of the control. Select it, right-click on it and choose Edit Template -> Edit Current. The 'Objects and Timeline' pane will be populated with its template parts. Change the elements' properties untill you get the desired look.